Treasures from a private Italian archive: The Italian director Michele Avantario was a close friend of Fela Kuti and a resident of the Kalakuta Republic founded by Kuti. From the 1980s up to the end of the ‘90s, Avantario accompanied the Afrobeat icon with his camera, filmed and collected rare footage about his life, including rousing live shows in Africa and Europe, an exclusive interview with Kuti, intimate family photos and his 1997 funeral attended by hundreds of thousands. 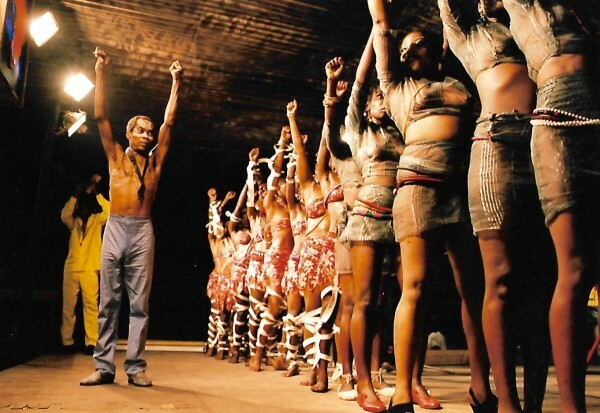 Today Avantario’s collection is the most comprehensive Fela Kuti archive in the world composed of films, photos and slides. These fragments about the last years from Fela Kuti’s life will be shown publicly for the first time. Filmmaker and photographer Armin Linke and Renata Di Leone, in cooperation with Giulia Bruno and Giuseppe Ielasi, reactivated and compiled the footage from Avantario’s estate. Intended as a suggested choice, encouragement to continue and to pay homage to all those who keep Fela Kuti’s legacy alive, the installation also reflects problems of appropriation and selection. How memory is narrated, framed and made accessible always implies questions of power, but in particular when it comes to the legacy of a man who was so influential on the African continent both musically and politically as much as Fela Anikulapo Kuti.